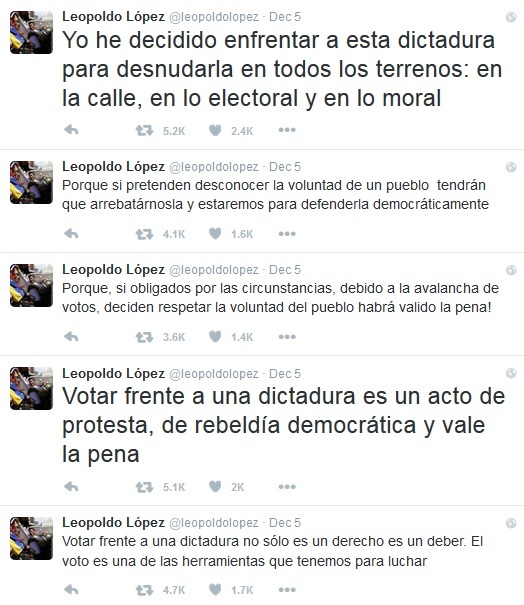 Leopoldo Lopez's nonviolent example of resisting Maduro's dictatorship delivers results but the struggle continues. 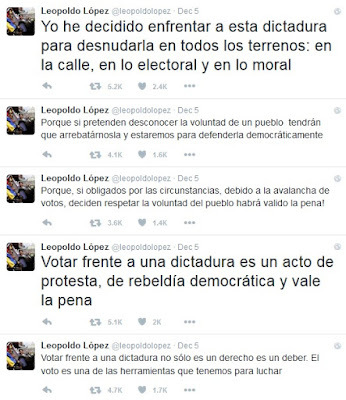 Leopoldo López Mendoza: "Voting against a dictatorship is not only a right it is a duty. Voting is one of the tools we have to fight. Voting against a dictatorship is an act of protest, of democratic rebellion and is worth it. Because if forced by circumstances, due to the avalanche of votes, they decide to respect the people's will it would have been worth it! Because if they are to ignore the will of the people they will have to take it from us and we will defend it democratically. I decided to confront this dictatorship to expose it in all areas: in the street, in the electoral and the moral." Four out of the five branches of the Venezuelan regime remain under the control of Maduro's party, the PSUV. 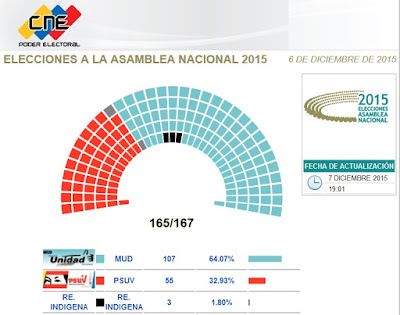 However there is a struggle over the final tally of legislators for the next National Assembly. The Maduro regime does not want the opposition to obtain super majority status ( which necessitates 111 opposition legislators). If the final is less than 111 then the Venezuelan regime can emasculate the National Assembly which is exactly what Maduro promised to do. The final vote ( despite all the regime's irregularities to swing the vote their way) should be at least 112 opposition legislators which could still rise to 116 to 51 pro-regime legislators. However the Electoral National Council (CNE) is only recognizing 107 opposition seats at this hour and 55 pro-regime legislators. 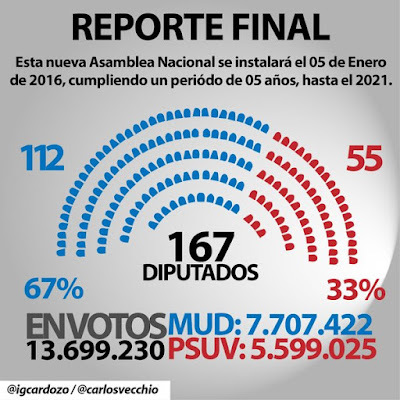 The numbers provided by Carlos Vecchio were in the final bulletin of the CNE but their website has not actualized the numbers. The Thursday prior to the election according to the Spanish daily ABC there was a meeting of high ranking officials that led to divisions over how much fraud and violence would be acceptable to steal the election and in the room was an unidentified Cuban general. According to Carlos Alberto Montaner in the Diario de las Americas, on election night four days later Nicolas Maduro and Diosdado Cabello wanted to impose a result in which the government won by two seats but two generals refused to go along and saved the day. All of this intrigue demonstrates that Venezuela is not a democracy and the rule of law is nonexistent, but this opposition victory, the result of popular discontent gives hope for the future. However there is still much to do to bring back democracy and the rule of law in Venezuela.